Tom ‘Carver’ Harvey uses a mixture of chainsaws and chisels to create individual large scale sculptures out of tree stumps and trunks. 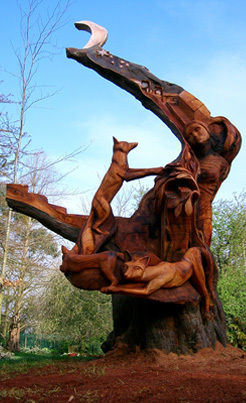 A background of fine art training followed by several years working in forestry and tree surgery has led Tom to discover this art form and specialise in the use of a chainsaw as a dynamic and creative tool. 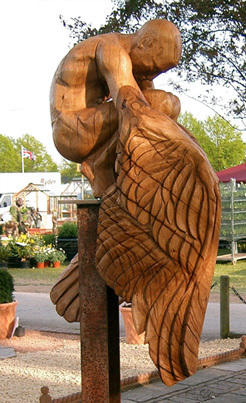 Tom Harvey specialises in working on large scale sculptures in wood, a natural, warm, organic and readily available material. 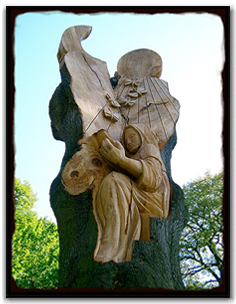 Using the chainsaw as his main tool he can produce large, ambitious sculptures in a relatively short space of time. The speed of the tool often allows ideas to flow freely and helps to create a sense of dynamism within the work. He also uses other power and hand tools to create smooth surfaces and areas of greater definition. Tom works within the tradition of direct carving, without the use of a scale model,making each piece a journey towards resolution that can take a few twists and turns along the way. Whilst working in this way (often in public places on very large visible sculptures) can be unnerving as it is hard to turn back on decisions made, the artist feels that this process of discovery makes the creation of the sculptures all the more exciting and intuitive. Whilst working on many public commissions with subject matter or themes prescribed by the commissioner (often local councils) the artist uses a high degree of imagination to come up with an idea that both fulfils the brief and also excites him. Tom's commissioned work often connects to central underlying themes within his work as a whole, that of the relationship between man and nature. He is deeply interested in the 'otherness' of the creatures that we share the world with and how the nature of animals and humans can mirror one another. The gap between civilization and the natural world is another central concern. Within these expansive themes Tom feels there is at least a lifetimes work. 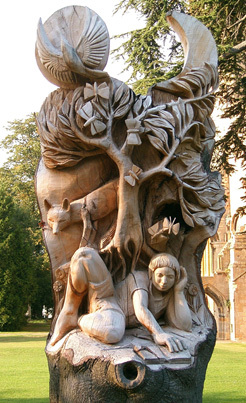 This sculpture was commissioned by Hillingdon Borough Council to make best use of a fantastic old Yew tree that had died, possibly from a lack of water with the water table dropping over the preceding ten years. 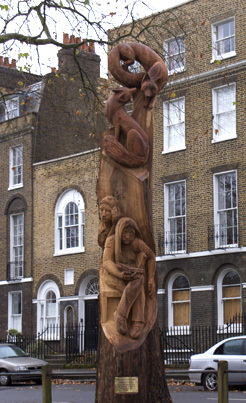 It is one of a series of four pieces commissioned around the borough. The council allowed Tom free reign in coming up with imagery and a theme for the sculpture which he was very grateful for. Within this piece Tom is looking at how nature always finds its way in to the man made environment and how within suburbia fluid and mysterious creatures exist. The fox is a source of fascination to the artist. It is the largest predatory mammal in the country which has an age old antagonistic relationship with man, being viewed as evil ( especially in Christian mythology and symbolism) and as a creature not to be trusted. It has been chased the length and breadth of the country possibly due to the associations attached to it. Yet here it is in our major cities digging up peoples gardens and waking us at night with its unnerving cries. It is a creature that lives between worlds in many senses and is incredibly adaptable, beautiful, shy and ruthless. The fox is a fine example of how you should 'never turn your back on mother nature'. 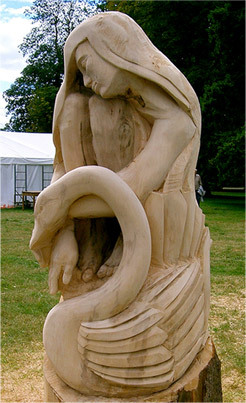 Within this sculpture the artist creates a narrative, forming a scene of a girl watching the fox at night. It is looking at a moment in time and evokes a sense of fascination and awareness between the fox and the girl. This sculpture was made by Tom when he was first starting to get to grips with working as a sculptor and it remains one of his favourite pieces. transforming into a bird and also from the line of a traditional song 'If these wings should fail me lord won't you meet me with another pair'.It can be seen to contain a variety of different ideas, those of uncertainty and potential, of the spirit rising above the physical or of mankind having to flee the ruins he has created which are represented in the rusting industrial structure of the girder. 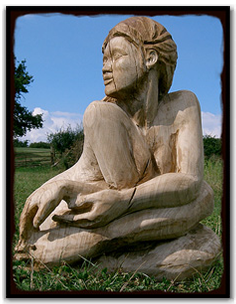 Tom’s public sculptures can be found all over England and Wales so why not take a look at the Carver Harvey sculpture trail on the gallery page and see if there’s a sculpture near you. 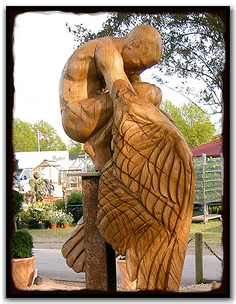 Have you seen a sculpture and want to let Tom know what you thought? Why not leave a message on the message board. "We looked on the internet and saw Tom’s work and it was the best work. He’s done lots of excellent pieces." "I was amazed to meet an American who knew our house in England by the sculptures in the front garden." "I would like to thank Tom for turning a good idea into a truly inspirational piece of art."